“A superb synthesis of today’s burning issues of globalization, the transition to post-industrial futures, the growth of post-carbon, “green” economies worldwide, changing paradigms in science, economics, and management—all enfolded in a deep cultural analysis of changing ethical, religious, and spiritual values. Marc’s deeply personal style illuminates his heroic synthesis. He shows how our endangered human family can redesign our various civilizations toward more peaceful, just, and sustainable futures for all life on Earth.” Hazel Henderson, author, Ethical Markets: Growing the Green Economy and Building a Win-Win World. Masterfully crafted to caringly expel the reader from the comfort of the sancrosanct.” Frederick C. Dubee, Senior Advisor, Global Compact, Executive Office of the Secretary-General, United Nations. 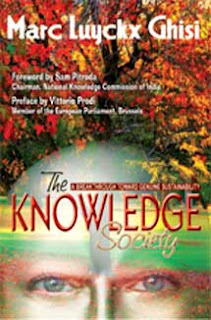 “The Knowledge Society provides dramatic insights into how the world will change within the next five decades. With his concept of a transmodern society, Marc Luyckx Ghisi opens a perspective to the powerful trends away from the industrial society with its pyramidal structures towards a planetary knowledge society based on cultural creativity.” Karlheinz Steinmuller, author, futurist, Director of Z-punkt GmbH, Büro für Zukunftgestaltung, Berlin. “Marc Luyckx Ghisi is a ‘transmodern’ renaissance man.” Walter Link, chair of the GlobalAcademy and the Global Leadership Network. “An important book, one that marks an important transition ... a blueprint for hope and wise action.” David Rooney, UQ BusinessSchool, University of Queensland. “A book of utmost relevance for our times.” Göran Carstedt, Ph.D., Chairman, The Natural Step International, former executive at Volvo and IKEA. ISBN: 81-89658-14-X; Price: Editions India Rs.375, Arunachala Press (international edition) $22.95, €21.95; Pages: 214; Size: 6 x 9 in.